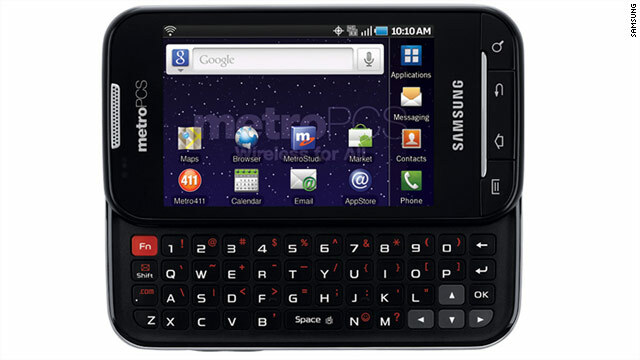 The Samsung Galaxy Indulge is a slider-style phone with a full qwerty keyboard and 3.5-inch touchscreen. (CNN) -- The economy is still tight, so for many U.S. mobile users a key obstacle to upgrading to a smartphone is cost. It's not just a matter of the upfront cost for the device. If you're feeling insecure about your future income stability, it might seem reckless to commit to two years of a monthly bill of $90 or more, plus the risk of "surprise" charges for overages of various kinds, and hefty early termination fees if you decide to cancel. This is why no-contract discount wireless carriers such as MetroPCS have been doing a brisk business, mainly in nonsmart "feature phones." But in the last few months MetroPCS has been aggressively rolling out its high-speed broadband LTE network. This week, the carrier began offering the nation's first LTE smartphone, the Samsung Galaxy Indulge. This phone is not cheap, but it's the kind of expense that many consumers would find manageable. The Indulge costs $399 to buy -- but there is no contract required, and plans cost $50/month (for up to 1 gigabyte of data) or $60/month (unlimited data). This combination of device class, network speed, affordable bills and flexibility to switch at will could lure many first-time smartphone customers. The Indulge is a slider-style phone with a full qwerty keyboard and 3.5-inch touchscreen. It runs Android 2.2 ("Froyo") and includes a 4-gigabyte memory card, but it will take up to a 32-gigabyte microSD card. MetroPCS has LTE networks in 13 U.S. markets: Atlanta; Boston; Dallas/Fort Worth; Detroit; North and South Florida; Las Vegas; Los Angeles; Bakersfield, California; New York; Philadelphia; Sacramento, California; and San Francisco. Tampa, Florida, is coming soon. Much of the rest of the nation is covered by the basic MetroPCS network -- which is not even 3G, so if an Indulge user travels out of LTE range, the connection speed would drop drastically. "I think it is through necessity, to be quite honest. One of the reasons we're transitioning to LTE is because of capacity and because that's where the industry is heading. Our core is 1xRT and we haven't really invested in EV-DO. There's an increase in consumer demand. ...We're trying as fast as we can to transition our handset profile and our network." So in effect, the MetroPCS strategy is to leapfrog straight into 4G network, while the major carriers are having to figure out how to upgrade from much larger existing 3G networks -- and pay for it, mainly by locking customers into two-year contracts. This approach could help MetroPCS keep its plan costs low and terms flexible. MetroPCS isn't the only option to get a no-contract smartphone at a low monthly cost. IntoMobile notes you can buy an unlocked Samsung Galaxy S that operates on GSM networks and get a SIM card and month-to-month plan from Simple Mobile (a mobile virtual network operator that sells access to T-Mobile's network). There is a catch: This phone costs considerably more than the Samsung Indulge (close to $600). However, it will run the latest version of Android -- and you'll still have a $60/month phone bill, with no contract or early termination fees.